Tuesday, April 9, 2019, at 5:30 p.m.
DEMO IN THE DINING ROOM! Please join Donna Bland, nationally-known artist and biannual instructor at the AKMA for a preworkshop demonstration. 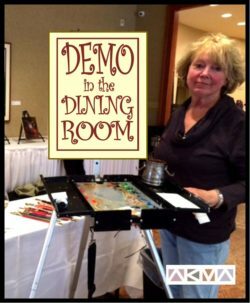 Donna will be sharing some tips and tricks while demonstrating how she composes a painting. Call us at (816) 233-7003 or CLICK HERE to sign-up online.